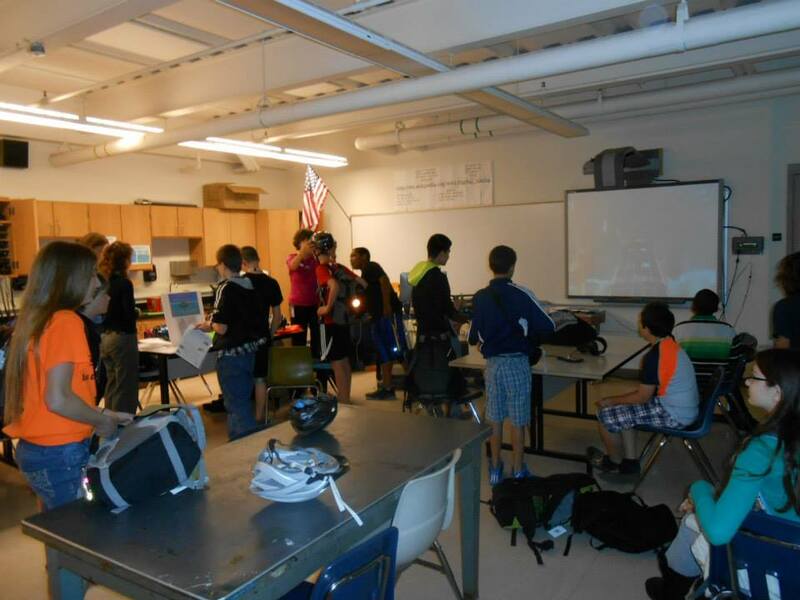 26 UMS students participated in the pilot month of Boltage, May 1 - May 24. From May 1 to May 24, students at Urbana Middle School took the challenge and signed up for Boltage, a new, free program that encourages young people to bike and walk to school. Students receive prizes - such as wrist bands, slap bracelets, bicycle helmets, and a cinch pack - depending on the number of days they biked to school in the 19 day period. At the end of the month, we celebrated with... what else? A pizza party in Mrs. Lodes' room. Calling all cyclists age 5-14! Walking School Bus programs can also bring community members together in positive ways as residents, law enforcement officers, schools, and city government officials advocate collectively for children's rights to walk to school safely. On November 15, Robert Johnson, a consultant from the PedNet Coalition guided members of the SRTS Project Steering Committee and Urbana School District staff and administrators through a WSB planning process. Members of Urbana School District, Champaign Regional Planning Commission, MTD, and CU Public Health are pictured (right) participating in a route planning exercise. C-U SRTS Project gives ENORMOUS thanks to our many community partners and dedicated individuals who volunteered their time to help make our six-week SPLASH bicycle skills and safety class a SUCCESS! Students of all riding levels received instruction on how to be a safer road cyclist, learning from League Certified Instructors (LCIs), and community experts in bicycle riding, repair, public health, planning, and transportation. 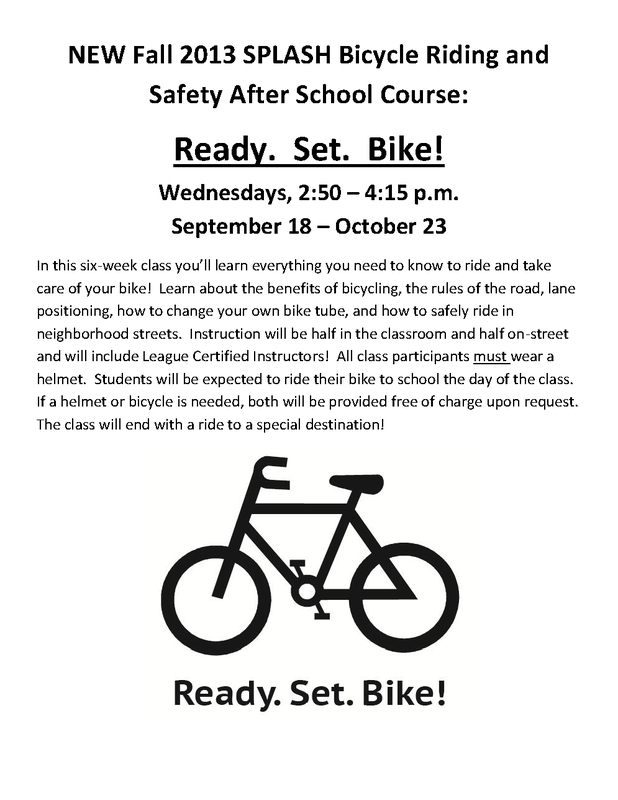 Read more about C-U SRTS Project after school bike class here! See media coverage here. 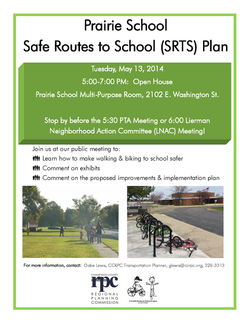 C-U Safe Routes to School Project is gearing up to celebrate Bike to School Day 2014 and Bike Month in Champaign-Urbana! Register your child for Bike to School Day and receive a free t-shirt (while supplies last) here. Also, visit C-U SRTS Project's Bike to School Day page here for resources and more information to get you and your bike ready for spring! ﻿CHECK OUT C-U SRTS Project's tips for being a safe walker and biker! LEARN the Ped Safety Dance! Bike to School Day Countdown! UMS bikers pose before starting the day on National Bike to School Day, May 8. Students from Kate Carlson's pre-kindergarten class at Washington Early Childhood Center in Urbana had a bike parade around the school and a picnic snack to celebrate Bike to School Day. Photo Credit: John Dixon. Yankee Ridge Elementary had 33 students bike to school. Bike to School Day 2013 CU student participation in the second annual National Bike to School Day was a record-breaking success! Students all the way from Pre-Kindergarten to High School participated in National Bike to School Day on May 8! Bike to School Day a success! enjoyed a bike parade and snack picnic! (Featured in the News Gazette with a great photo by John Dixon! See more photos of the CU Bike to School Day day here. 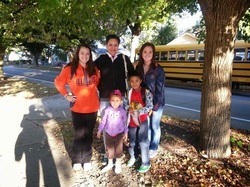 Walk n' Roll to School Day at King Elementary. International Walk n' Roll to School Day! 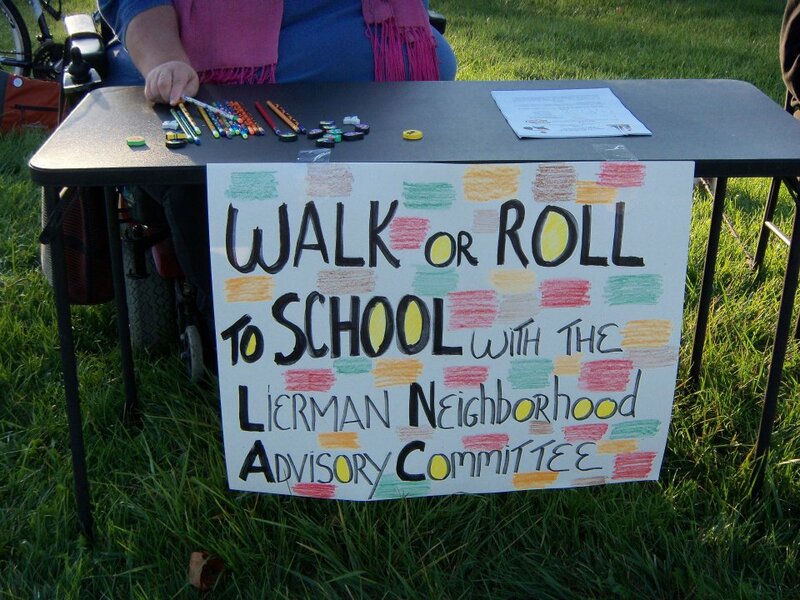 Read about it on our special Walk n' Roll to School webpage here. We walked, we rolled, we went to school! Walk to School Day Checklist! Celebrations of Walk n' Roll to School Day vary by school so for information about festivities, talk to your teacher or principal! The air has cooled and C-U Safe Routes to School Project will be out at the Market at the Square THIS SATURDAY Sept. 21st to help kids ages 5-14 improve their cycling skills! This FREE and FUN obstacle course helps kids practice navigating obstacles in the road, turning, signaling, yielding, and improving balance. Helmets will be on sale for $10 (we have adult sizes too) and staff will be available for fitting consultations. Download the event flyer but clicking the link below. 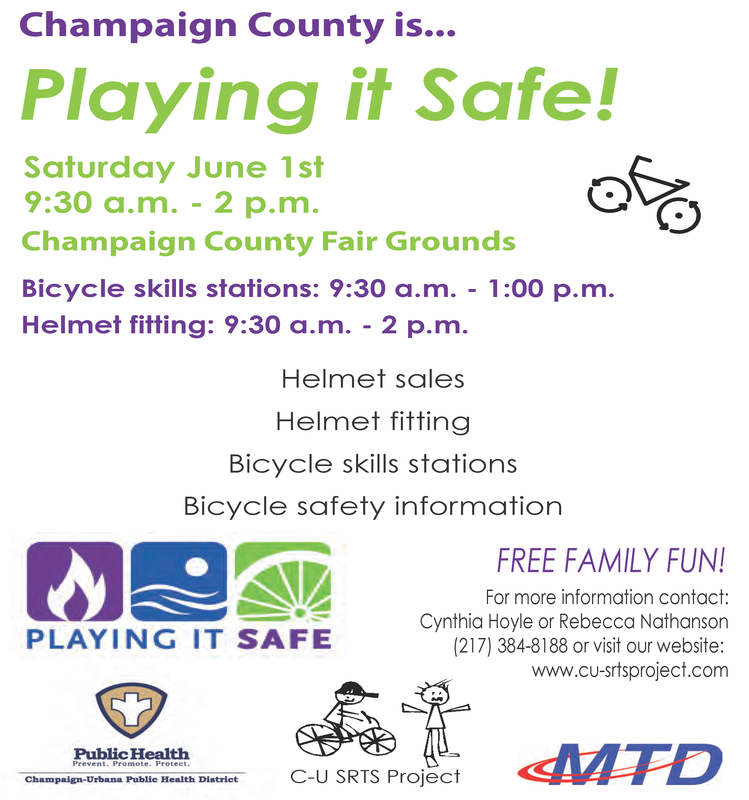 Over 90 kids bicycled through the CU SRTS Bike Rodeo at Playing it Safe June 1st! The Illinois DOT awarded NCPAD funding for two SRTS non-infrastructure grants for a one-year project, according to Sheila Swann-Guerrero, information specialist for the NCPAD. NCPAD is funded by a grant from the Centers for Disease Control and Prevention, National Center on Birth Defects and Developmental Disabilities Division of the Human Development and Health Program and is based at the University of Illinois. According to its Web site, its mission is “to promote substantial health benefits that can be gained from participating in regular physical activity,” and Swann- Guerrero said active travel to school fits with that mission. The Center provides information and resources to enable people with disabilities to become as physically active as they choose to be, according to the Web site. The NCPAD slogan is Exercise is for EVERY body. Tell me more! In 1995, LSNA began the Parent-Mentor program, in which parents work in eight of the neighborhood schools. Each year, about 120 parents, or 10 to 15 parents per school, are hired and trained to assist teachers for two hours each school day. At the beginning and end of each day, some of the parents act as crossing guards and help the children to cross nearby streets. Although the city provides crossing guards at major street crossings, the parent-mentors help the children at smaller street crossings near the school. Tell me more!